Years ago, children used to ride sitting on modified lawn chairs in cars. Yes, it’s true! Fast forward to now, and child seat design has come a long way. More significantly, the engineering of those designs must meet U.S. legal requirements. 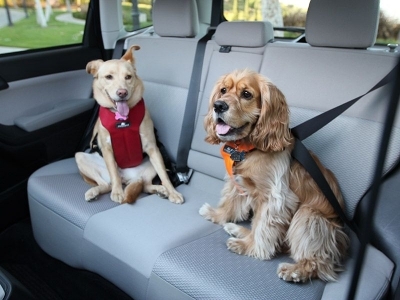 The Center for Pet Safety (CPS) is working to do the same thing for pet travel products. Pet travel products have been promoted for years by manufacturers as tools to keep your pet safe, but there were no safety standards and most brands had never tested their products. Unfortunately, until CPS, no one ever scientifically evaluated pet travel harnesses, crates, carriers and pet travel seats to determine what they really need to do to protect vehicle occupants. Thanks to Subaru of America’s sponsorship of our studies, CPS has spent the last several years testing pet travel products, and we have learned a lot. Our friends Blossom and Jasper were very comfortable in the Sleepypod Clickit Utility and Clickit Sport harnesses, traveling in our demonstration vehicle, the 2015 Subaru Forester.